Showing results for tags 'Lens'. I've been quite impressed with the 35/1.4 (Version IV) and the collapsable 50/2 (Version I). What are your favorite smallest and most versatile Leica M lenses? I have an aged lens that has a loose integrated sliding hood, since it's fitted outside of the lens group/barrel, it might not need an expert to do it. Does anyone know how a DIY trick? Hello from China everyone! My first post here, so please bear with me. I’m not a photographer or even close to it. I just want to learn more and do some things which I will get into later perhaps. I own a LEICA D-Lux Typ 109. I love it. I was wondering if there is any way of removing the lens and attaching the body to a LEICA APO-Televid 82mm or perhaps even a NIKON Monarch Spotting Scope body? I will leave the question at that and only get into more tech details if the replies warrant. HI, what's the best lens mount adapter for Leica M lens to Sony E.MONT that have you tried ? Thanks a lot. Sell it or keep it ? Hi Long story, but I somehow wound up with a 35mm 1.4 ASPH Summilux-M (the 11 874 version) and a 35mm 1.4 ASPH Summilux-M (the 11 663 version). The 11874 was my favorite lens, but now I prefer the 11663. I don't need the money right now, and it's not really taking up appreciable space in my apartment, but it seems to be selling for $4000 or so on auction - which is actually more than I paid for it back in the 90's. Is the general consensus that used lens prices will continue to increase ? Or should I sell it now while I can ? Thanks ! Who will solve this one? I have attached an interesting photo of Winogrand working, taken by photographer Tod Papageorge in 1967. The problem is as follows: Winogrand is using two Leicas (I assume) - up to his eye is one with a Canon 35mm f/1.8 attached. Down towards his left hip is another camera with a mystery lens. Which one is it? As Papageorge took this picture, Winogrand had just finished taking one of his most famous photographs. Seemingly with a 35mm Canon (not the well known 28mm he often used, and perhaps even made famous). Also of interest, I have actually seen his contact print. The roll starts off in London, then BOOM, first strike back in Central Park gives an iconic photo. This should be fun! First of all, say hi to all the members here as I'm a new coming. Recently I've got a summicron 35 f/2 ASPH (11882) lens, when using it with my M240, I found sometimes it can produce very scary color for the very vivid part of the image, especially for magenta. Please check the attach files. The flowers seems to be a mess and the color looks far more saturation than the real scenery saw by eyes. Has anyone also encountered similar issues? What is related to? The lens or the camera body? Or I didn't get it on focus but I also tried to close the aperture the issue still exists. I tried to fix it in lightroom, it can become better and still very annoying. It also seems has something to do with white balance. What adapter do I need to make a Jupiter 12 lens fit my Leica M4? Hi, I'm new to Leica's and I have just bought an M4 but as I'm on a pretty tight budget, I bought a Jupiter 12 35mm lens. I've heard good things about this lens for the price but as it doesn't currently fit the M4 I've read that I need an adapter for it. Does anybody know the exact adapter I need? I've seen some on eBay that I think might do the trick but I can't be sure and I don't want to buy the wrong thing! Thanks. I have just recently bought a Summarex 85mm f 1.5 lens. In y opinion it is capable of producing sharp and exciting images, as well as some very soft creamy edged images. Are there any other Summarex users who use this lens for regular photo images? I use the lens on an M Monochrome and Sony Ar7IIr. I just found (yet another...) 'Made in Germany' 35/1.4 v2 (11870). S/N is 3433XXX, which indicates that its birth date was sometime in 1987 if I'm not mistaken. It comes in its original box, with matching serial on the sticker. Interestingly, however, the writing on the box says 'Made in Canada'. 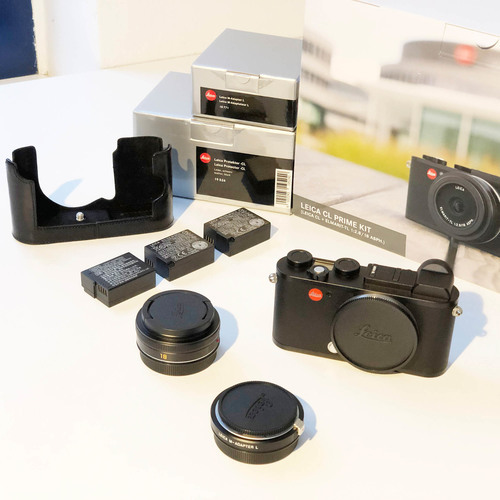 I know it was some kind of a transition period for Leica, with parts from Canada being sent back to Germany, but it's the first time I see such a lens/box mismatch. Out of curiosity, a quick question for the experts here: have you seen this before? Hi, i like to rent a lens for a portrait project that i have in mind. I would like to take 3/4 length portrait shots with the person holding a plate of food in their hands. Emphasizing the person and the food at the sam time. Also I would like to keep the person separated from the back ground and most likely would use a white wall or natural background color. What focal length would you recommend. I see that my choices are 50mm, 75mm and 90mm. I should have ample space to set the shot up and i am using Leica M240. Thank you for your advise. I am experiencing an unfortunate problem with my APO-Summicron 90mm. After a brief portrait session at the office, I left the lens at the camera, over a desk. I almost always use it wide open and occasionally at f/5.6, but this time I went for f/16. When I returned to put it back to the leather case I noticed that the aperture ring was totally loose. It’s now spinning 360 degrees and the aperture blades don’t move at all. I always felt that the ring was too soft for my taste. I’d prefer it to be stiffer. But I never felt that there was a problem. In fact, the lens is still in very good shape and it never gets any rough using. I live in Brazil and I was just planning to take it for a trip do Portugal in about 45 days. I keep my equipment under an insurance that covers for damage. But if this is something relatively easy/cheap/quick to repair, I would prefer not to call the insurance company. Did any of you guys experienced something like this? Any help will be much appreciated. Thanks! Summilux 35 ASPH FLE prone to dust?